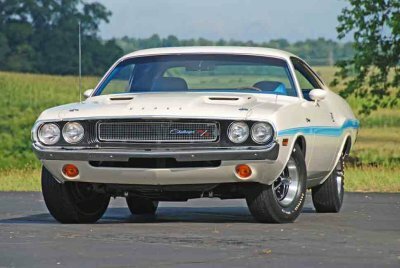 Dave Waldens 1970 Challenger has set a new Gold Standard in correctness. 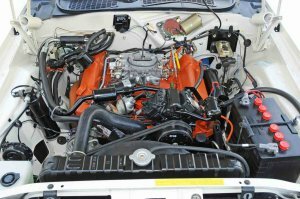 A no-expense-spared effort, Dave documented every step in the resto process, even showing the NOS parts that he used in their original bags prior to their being installed. He spent years researching how these cars originally came to dealerships from the factory. He looked at many original, unmolested Challengers top determine what was correct. He talked to people who worked on the assembly line. Then, he duplicated, as much as humanly possible, the actual factory assembly/painting techniques to come up with the gem that we featured in our February issue, plus some of the details that you see here. the magic of the internet and your home computer allows you to blow em up to see the details. In spite of all this, Daves car is not without controversy. Some knowledgeable folks in the hobby question some of the parts Dave used, as far as being correct. No one faults him on his technique, which frankly, probably never will be equaled, let alone surpassed. A/C condenser bracket shows date code. it was loosened, adjusted, and put into place. This left a bare-metal spot from the washer. Dave, in turn, questions the authorities who question his car. He points to his own documentation, research, and the fact that because Chrysler used more than one vendor, and human performance variations on the assemblyline, there would be variations between cars coming out of the factory. Cars came either with assembly line numbers marked on the valve cover, or a tag like this that was stuck behind the alternator. Most everyone goes with the valve cover markings, so Dave went with the tag that he reproduced. 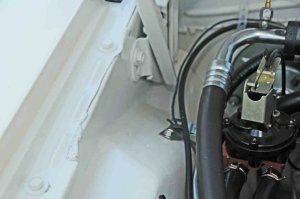 The 116 (behind sparkplug wires), which would have been on the valve cover, indicates a 440 with air conditioning. B stands for Hamtramck. 2.5 is degrees before top dead center. FN is the engine plant. 10″ is the 10th line of the engine. S is a vendor code. Our article may have given the impression that we were casting our own doubts on the perfection of Daves car. Such is not the case. We didnt work on the assemblyline, and we didnt do the intensive research that Dave did. We do, however, remember these cars when they were new. 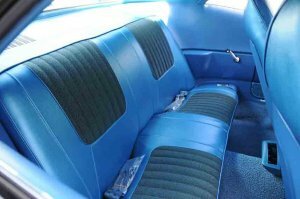 And, if our memory serves, Daves Challenger is the closet thing weve ever seen that matches the details of a brand new 70 Challenger. NOS A/C expansion valve was found at at swapmeet. Stickers are factory-exact ECS repops of originals. Original A/C hoses were refinished, ends replated, and restamped. 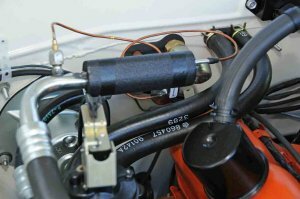 Heater hoses also are originals that were refinished and restamped. Black foam on line is an assemblyline piece that differs from NOS. And, the fact that Daves white Challenger with blue stripe is a one-of-one, is the icing on the cake. 3-finger wire bracket mounted on inner fender is an original, impossible-to-find item. You can see the 2-part expansion sealer (not the usual seam sealer) that hardens, on the firewall and top of inner fender. Firewall/cowl area shows natural paint drips from factory-style painting techniques. 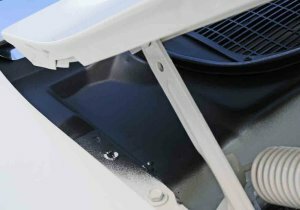 Black overspray around vent area is correct patternnot a hard paint line. Rubber seal on vent is factory-original. Dave says the hardware securing the master cylinder plate to the firewall are original pieces that were bead blasted, replated and then polished to get the correct sheen. Then they were dipped in liquid black rubber. 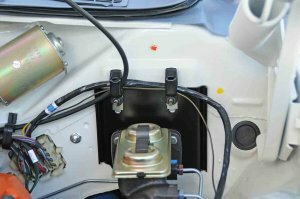 All master cylinder components are original. The black hard plastic plug to the right, is original that was bead blasted for a like-new appearance. The two (red and yellow) inspection marks on the firewall is unusual, as one is the rule. The marks are spattered like the originals. The inspection mark indicates that the master cylinder was filled and bled. The 2 marks may be because there was a problem with the brakes, and the master may have had to be bled a second time. 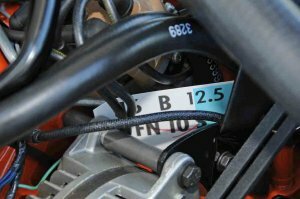 Wiring harnesses are NOS or original to the car. Dave bead blasted original wire connectors, and then spent hours to get them to look correct-as-new. 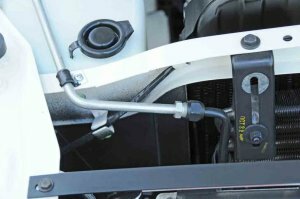 Wiper hoses are originals that have been bead blasted (you have to use the right kind of glass beads for this). It makes the rubber look new. Dave bought 5 NOS wiper motors (3 grand) and took the best parts of each. This is original plating, nothing has been redone. Note green and black wires coming out of the heater blower motor. There is a small black band around them. When these blower motors were shipped to the factory, the 2 wires were taped together with black masking tape to keep them from flopping around. The assemblyline workers just tore the 2 wires apart, leaving a small portion of the black tape remaining. This is a good view of the correct cowl blackout overspray that extended to the inner fender. Note no hard paint line. Cowl blackout overspray extends to the concave area on the rear hinge rod. It looks like a shadow until you enlarge the image for a better view. NOS grille was argent colornot correct for an R/T. Steve repainted the grille, duplicating the factory overspray using dart tapea round, foam stick tape. Most restored cars have a distinct paint line, which is not factory-correct. Rear seatbelts came from the factory in a 9 plastic bag that was folded over and secured with a single rubber band. Dave has repopped the correct bag, and its available on his website. 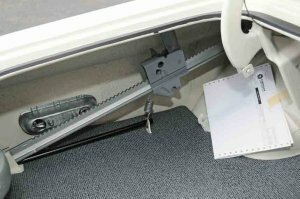 All interior materialsseat vinyl and inserts, door panels, armrests, carpeting, etc. are all NOS. Front seatbelts were in bags on the floor when the car was delivered to the dealer. Dash is NOS that has been redyed. Rally instrument panel is assembled from NOS pieces, as the original didnt look nice enough. Wheel and column are original to the car. Armrest area is all NOS including hardware. Window crank is original as are the torx-head screws. You cant replate the screws because the factory patina finish cant be duplicated. Dave just cleaned em up. Heres something you never see on restorations: Check out the vinyl trim at the bottom of the carpeted deluxe door panel. Dave duplicated the factory splice by melting the two pieces of vinyl together and creating the correct splice pattern. Wrinkle in corner of dash is a duplication of the original sloppy factory work. All the parts that would have come to the dealer in the trunk-rear license plate hardware, front license plate bracket and hardware, tire valve extensions, etc are in original or Daves correctly repopped plastic bags with correct lettering. Traveler sheet (upper left in trunk) shows basically the top line of the build sheet (VIN, etc.) Jack is date-coded, back of market lights have the original galvanized finish. Original rubber plugs differ from repops available. Trunk mat also is an original. 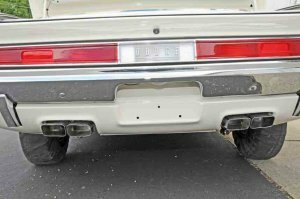 Tailights are NOS as are exhaust tipsnote how uneven the tips are. Dave determined that the available repop cards for the 6-way seat were not correct (size, lettering etc.) So he reproduced ones that are factory-correct. Console and shifter handle, ball, etc. are NOS. Keys (the second set) with the index ring and the tag with the key codes would have come inside the console in this cloth bag. Dave now repros the bag. The tag with the codes was supposed to be destroyed to avoid unauthorized key duplication. but he had to shell out $900 for an NOS one that then had to be replated. 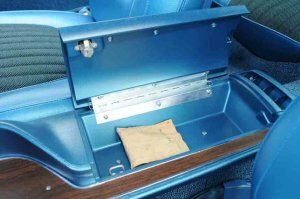 Original customer paperwork resides inside glovebox. 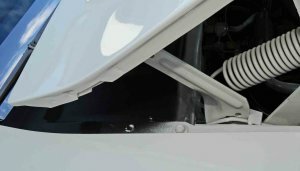 Most restorers try to tune up the lettering on the heater-A/C control panel with white paint and a Q-tip or fine brush, with mixed results. Dave went the opposite route. First, he bead-blasted all the little controls. 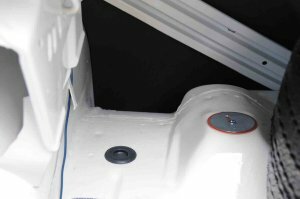 Then Dave sprayed the control panel with white urethane paint, H sprayed the perimeter in a silver urethane (he used an airbrush). He let the paint set up for 3 weeks. Then, he sprayed the entire panel in black lacquer, and then took a piece of T-shirt material stretched tight over his finer, dipped in lacquer thinner, and removed the black paint from all the high spots (the letteringfan, A/C etc. The white urethane over the lettering, and the silver border were unaffected by the thinner, producing razor-sharp details. The area to the right of the panel is correctly sprayed in black wrinkle paint. Flat black is not correct. Q-clamps on mufflers are assemblyline issue. Rear springs are originals that were reached, and have a correct furnace finish. U-bolt is an original which has a flattened radius on top (not visible) both on the inside and outside of the radius. Shocks and E-brake cable are NOS. Red tag is an ECS repro item. All finishes that you see here are correct. 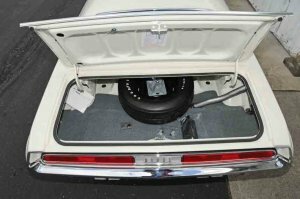 Hemi cars had the exhaust head pipes clamped to the resonators, but not 440 cars these had the head pipes welded. Dave had correct-dated resonators, but they didnt look new. He paid 5 grand for these resonators, even though they had the wrong date code, for appearance sake. Undercar view shows torsion bars that were dipped and have drips. The NOS head pipes had to be tweaked for correct fit. Tie rods linkage and hardware correct finishes. The inspection marks were put on the steering linkage before cotter pins were installed. So there should be no paint on cotter pins. The lower control arms are refinished and coated with Cosmoline. The oil pan was painted the way the factory did it. There are no drips, but the paint is very thin in some areas. Underbody shows primer showing in some areas due to factory quickie spray job. Note assemblyline (green) oil filter. Also note correct finishes and overspray. -Factory exact R/T Challenger longitudinal stripes in ANY color. Made to perfect original specs. No others offer these in a correct version.